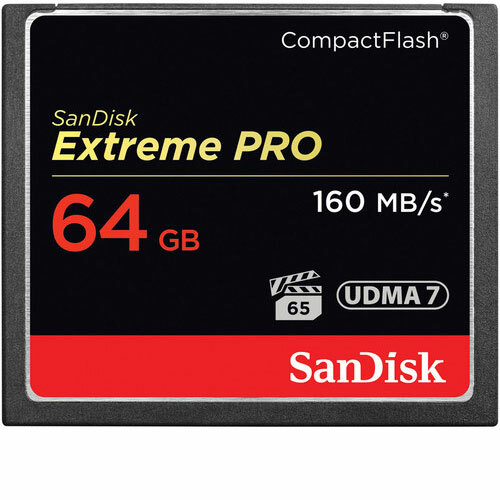 The 64GB Extreme Pro CompactFlash Memory Card from SanDisk features enhanced data read speeds of up to 160MB/s along with data write speeds up to 150MB/s. This Extreme Pro CompactFlash Card is designed to support both full HD and 4K video as it is VPG-65 certified. VPG-65 (video performance guarantee) offers sustained data write speeds of 65MB/s ensuring a smooth flow of data keeping video streams crisp and clean. This CompactFlash card is also compatible with both RAW and JPEG file formats and comes equipped with an RTV silicone coating and writable label. SanDisk EXTREME PRO CF 64Gb compactflash memory card is available for rent or hire from RENTaCAM Sydney.